When a computer send out a data packet to destination computer, it will issue a UDP packet that contain both the port number of sending computer and destination computer. To understand what is User Datagram Protocol (UDP), we need to have some basic concept of “Port”. A port may be considered as the “communication point” of a computer. As we know, there are many applications (e.g. web server, FTP server, mail server, etc..) running in a computer. Each application will occupy a specific port. Therefore a computer allow many applications running in the same time without interfere or confict with each others. Let’s take the network below as an examle. 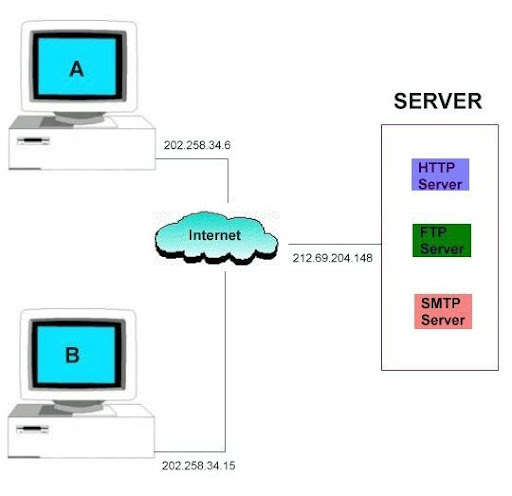 The server is running three applications – HTTP server, FTP server and SMTP server. This is a very common case that a server has running these three applications. If Computer A open a browser and wish to download a we bpage from the server. How can the server know that this is a HTTP request? If Computer B wish to upload a file to the server. How can the server know that this is a FTP request? Since the server has only one ethernet cable connect with the Internet and has only one IP address, all data packets have passed through the same wire. There must be a solution that allow the server know that the data packets go to the correct application. Let’s discuss this topic in more details tomorrow.